• All day, Light vehicle sales for February. The consensus is for light vehicle sales to increase to 17.7 million SAAR in February, from 17.5 million in January (Seasonally Adjusted Annual Rate). • At 8:30 AM, Personal Income and Outlays for January. The consensus is for a 0.3% increase in personal income, and for a 0.3% increase in personal spending. And for the Core PCE price index to increase 0.2%. • At 10:00 AM, ISM Manufacturing Index for February. The consensus is for the ISM to be at 56.1, up from 54.7 in December. • Also at 10:00 AM, Construction Spending for January. The consensus is for a 0.2% increase in construction spending. Freddie Mac reported that the Single-Family serious delinquency rate in January was at 0.99%, down from 1.00% in December. Freddie's rate is down from 1.33% in January 2016. It has been more than ten years since the bubble peak. In the Case-Shiller release this morning, the seasonally adjusted National Index (SA), was reported as being 1.4% above the previous bubble peak. However, in real terms, the National index (SA) is still about 14.5% below the bubble peak. The year-over-year increase in prices is mostly moving sideways now just over 5%. In December, the index was up 5.8% YoY. In the earlier post, I graphed nominal house prices, but it is also important to look at prices in real terms (inflation adjusted). Case-Shiller, CoreLogic and others report nominal house prices. As an example, if a house price was $200,000 in January 2000, the price would be close to $278,000 today adjusted for inflation (38.9%). That is why the second graph below is important - this shows "real" prices (adjusted for inflation). The first graph shows the monthly Case-Shiller National Index SA, the monthly Case-Shiller Composite 20 SA, and the CoreLogic House Price Indexes (through November) in nominal terms as reported. In nominal terms, the Case-Shiller National index (SA) is at a new peak, and the Case-Shiller Composite 20 Index (SA) is back to August 2005 levels, and the CoreLogic index (NSA) is back to September 2005. In real terms, the National index is back to April 2004 levels, the Composite 20 index is back to December 2003, and the CoreLogic index back to March 2004. In real terms, house prices are back to late 2003 / early 2004 levels. On a price-to-rent basis, the Case-Shiller National index is back to October 2003 levels, the Composite 20 index is back to July 2003 levels, and the CoreLogic index is back to July 2003. In real terms, and as a price-to-rent ratio, prices are back to late 2003 / early 2004 - and the price-to-rent ratio maybe moving a little more sideways now. Manufacturing activity strengthened in February, pushing the composite index to 17 from the previous reading of 12. It seems likely the ISM manufacturing index will show stronger expansion in February (to be released tomorrow), and the consensus is for a reading of 56.1. Real gross domestic product (GDP) increased at an annual rate of 1.9 percent in the fourth quarter of 2016, according to the "second" estimate released by the Bureau of Economic Analysis. In the third quarter, real GDP increased 3.5 percent. Here is a Comparison of Second and Advance Estimates. PCE growth was revised up from 2.3% to 3.0%. (solid PCE). Residential investment was revised down from 10.2% to +9.6%. This was below the consensus forecast. Mortgage rates moved slightly higher after a strong run to the lowest levels of the year as of last Friday. ... For now, rates are still much closer to 2017's lows. Most borrowers would be quoted the same rate as last Friday, but with slightly higher upfront costs today. The average lender continues to quote 4.125% on top tier scenarios, though there are a few lenders at 4.0% and 4.25%. • At 8:30 AM ET, Gross Domestic Product, 4th quarter 2016 (second estimate). The consensus is that real GDP increased 2.1% annualized in Q4, up from the advance estimate of 1.9%. • At 9:00 AM, S&P/Case-Shiller House Price Index for December. Although this is the December report, it is really a 3 month average of October, November and December prices. The consensus is for a 5.4% year-over-year increase in the Comp 20 index for December. • At 9:45 AM, Chicago Purchasing Managers Index for February. The consensus is for a reading of 52.9, up from 50.3 in January. • At 10:00 AM, Richmond Fed Survey of Manufacturing Activity for February. This is the last of the regional Fed surveys for February. 1.Improved border security and more aggressive deportations that lower the number of undocumented workers by 200,000 per year. This could be achieved by increasing annual deportations from about 400,000 to 500,000 and stopping 100,000 more people per year at the border. 2. Cut the number of undocumented workers in half over a four year period through tougher enforcement. 3. Effectively eliminate all undocumented workers over a four year period. In the first scenario the economic impacts are likely to be very small. ... The story is very different under the second and third scenarios. Undocumented immigrants tend to specialize in certain kinds of jobs. Hence cutting the labor force in these areas could hurt the productivity of complementary workers causing indirect loses beyond the direct labor force reduction. ... With full deportation an outright recession seems plausible, as output would be disrupted and as the Fed may be unwilling to act because a labor shortage would mean a surge in wage and price inflation. Undocumented immigrants are a relatively small part of the overall labor force [and] our baseline is relatively benign, but we see significant downside risks to that baseline. The general business activity index returned to positive territory in October 2016 and has pushed further positive every month since, reaching 24.5 this month. The Richmond Fed manufacturing survey for February will be released tomorrow. Based on the surveys released so far, it appears manufacturing was very strong in February. The Pending Home Sales Index, a forward-looking indicator based on contract signings, decreased 2.8 percent to 106.4 in January from an upwardly revised 109.5 in December 2016. Although last month's index reading is 0.4 percent above last January, it is the lowest since then. The PHSI in the Northeast rose 2.3 percent to 98.7 in January, and is now 3.6 percent above a year ago. In the Midwest the index fell 5.0 percent to 99.5 in January, and is now 3.8 percent lower than January 2016. This was well below expectations of a 1.1% increase for this index. Note: Contract signings usually lead sales by about 45 to 60 days, so this would usually be for closed sales in February and March. The year-over-year increase in this index has been about the same (5% to 5.7% range) for the last year, although the index picked up a little at the end of 2016. Note that house prices are close to the bubble peak in nominal terms, but not in real terms (adjusted for inflation). Case-Shiller for December will be released tomorrow. The automakers will report February vehicle sales on Wednesday, March 1st. Note: There were 24 selling days in February 2017, unchanged from 24 in February 2016. A WardsAuto forecast calls for U.S. automakers to deliver 1.34 million light vehicles in February, a 16-year high for the month. A daily sales rate of 55,949 units over 24 days represents a 0.1% improvement from like-2016 (also 24 days). Total vehicle sales in February are expected to be similar to a year ago while incentives remain at record levels, according to a forecast developed jointly by J.D. Power and LMC Automotive [17.7 million SAAR]. The key economic report this week is the second estimate of Q4 GDP. Other key indicators include the February ISM manufacturing and non-manufacturing indexes, February auto sales, and the Case-Shiller house price index. 8:30 AM: Durable Goods Orders for January from the Census Bureau. The consensus is for a 1.8% increase in durable goods orders. 10:00 AM: Pending Home Sales Index for January. The consensus is for a 1.1% increase in the index. 8:30 AM: Gross Domestic Product, 4th quarter 2016 (second estimate). The consensus is that real GDP increased 2.1% annualized in Q4, up from advance estimate of 1.9%..
9:00 AM ET: S&P/Case-Shiller House Price Index for December. Although this is the December report, it is really a 3 month average of October, November and December prices. This graph shows the nominal seasonally adjusted National Index, Composite 10 and Composite 20 indexes through the November 2016 report (the Composite 20 was started in January 2000). The consensus is for a 5.4% year-over-year increase in the Comp 20 index for December. 9:45 AM: Chicago Purchasing Managers Index for February. The consensus is for a reading of 52.9, up from 54.6 in December. 10:00 AM: Richmond Fed Survey of Manufacturing Activity for February. This is the last of the regional Fed surveys for February. All day: Light vehicle sales for February. The consensus is for light vehicle sales to increase to 17.7 million SAAR in February, from 17.5 million in January (Seasonally Adjusted Annual Rate). 8:30 AM: Personal Income and Outlays for January. The consensus is for a 0.3% increase in personal income, and for a 0.3% increase in personal spending. And for the Core PCE price index to increase 0.2%. 10:00 AM: ISM Manufacturing Index for February. The consensus is for the ISM to be at 56.1, up from 54.7 in December. The ISM manufacturing index indicated expansion at 56.0% in January. The employment index was at 56.1%, and the new orders index was at 60.4%. 10:00 AM: Construction Spending for January. The consensus is for a 0.2% increase in construction spending. 8:30 AM ET: The initial weekly unemployment claims report will be released. The consensus is for 240 thousand initial claims, up from 239 thousand the previous week. 10:00 AM: the ISM non-Manufacturing Index for February. The consensus is for index to increase to 57.2 from 57.1 in December. 2:00 PM: Speech by Fed Chair Janet Yellen, Economic Outlook, At the Executives Club of Chicago, Chicago, Ill. Here is the unofficial problem bank list for February 2017. Update on the Unofficial Problem Bank List for February 2017. During the month, the list dropped from 163 to 155 institutions after nine removals and one addition. Aggregate assets fell by $1.25 billion to $41.8 billion. A year ago, the list held 229 institutions with assets of $66.0 billion. Actions were terminated against Bank of Bartlett, Bartlett, TN ($359 million); Farmers & Merchants Bank, Eatonton, GA ($170 million); Solera National Bank, Lakewood, CO ($149 million Ticker: SLRK); Liberty Bell Bank, Marlton, NJ ($145 million Ticker: LBBB); Gulf Coast Community Bank, Pensacola, FL ($135 million); Colonial Co-operative Bank, Gardner, MA ($73 million); and American Patriot Bank, Greeneville, TN ($58 million). Several banks merged to find their way off the problem bank list including Polonia Bank, Huntingdon Valley, PA ($276 million Ticker: PBCP) and MBank, Gresham, OR ($158 million Ticker: MBNC). The addition this month was Ashton State Bank, Ashton, NE ($23 million). We anticipate for the FDIC on Tuesday to release industry results for the fourth quarter and updated figures for the official problem bank list. New home sales for January were reported at 555,000 on a seasonally adjusted annual rate basis (SAAR). This was below the consensus forecast, and the three previous months were all revised down. So overall this was a disappointing report. Sales were up 5.5% year-over-year in January, However, January and February were the weakest months last year on a seasonally adjusted annual rate basis - so this was an easy comparison. Note that these sales (for January) occurred after mortgage rates increased following the election. As I've noted before, interest rate changes impact new home sales before existing home sales because new home sales are counted when the contract is signed, and existing home sales at the close of escrow. This is just the second month of data after the rate increase, and we might be seeing a small dip in sales due to higher interest rates. However, so far, we haven't seen any impact on existing home sales. It will take several months of data to see the impact of higher mortgage rates - and this is the seasonally weak period - so we might have to wait for the March and April data. Earlier: New Home Sales increase to 555,000 Annual Rate in January. This graph shows new home sales for 2016 and 2017 by month (Seasonally Adjusted Annual Rate). Sales were up 5.5% year-over-year in January. New home sales averaged 559 thousand per month (SAAR) in 2016, so January was about at the average rate for last year. The "distressing gap" graph shows existing home sales (left axis) and new home sales (right axis) through January 2017. This graph starts in 1994, but the relationship had been fairly steady back to the '60s. The University of Michigan consumer sentiment index for February was at 96.3, down from 98.5 in January. The Census Bureau reports New Home Sales in January were at a seasonally adjusted annual rate (SAAR) of 555 thousand. The previous three months were revised down..
"Sales of new single-family houses in January 2017 were at a seasonally adjusted annual rate of 555,000, according to estimates released jointly today by the U.S. Census Bureau and the Department of Housing and Urban Development. This is 3.7 percent above the revised December rate of 535,000 and is 5.5 percent above the January 2016 estimate of 526,000." The months of supply was unchanged in January at 5.7 months. "The seasonally-adjusted estimate of new houses for sale at the end of January was 265,000. This represents a supply of 5.7 months at the current sales rate." In January 2017 (red column), 41 thousand new homes were sold (NSA). Last year, 39 thousand homes were sold in January. This was below expectations of 573,000 sales SAAR. I'll have more later today. The Federal Reserve Bank of Kansas City released the February Manufacturing Survey today. According to Chad Wilkerson, vice president and economist at the Federal Reserve Bank of Kansas City, the survey revealed that Tenth District manufacturing activity expanded further with continued strong expectations. The month-over-month composite index was 14 in February, its highest reading since June 2011, up from 9 in both January and December. The composite index is an average of the production, new orders, employment, supplier delivery time, and raw materials inventory indexes. Activity in both durable and nondurable goods plants increased, particularly for metals, machinery, computer, and electronic products. Most month-over-month indexes improved moderately in February. The new orders, order backlog, and employment indexes all edged higher, and the new orders for exports index moved into positive territory for the first time in over a year. ... The future composite index moved higher from 27 to 29, its highest reading since the survey moved to a monthly frequency in 2001. The Kansas City region was hit hard by the decline in oil prices, but activity is expanding solidly again. The regional Fed surveys suggest a strong reading for the ISM manufacturing index for February. According to Black Knight's First Look report for January, the percent of loans delinquent decreased 3.9% in January compared to December, and declined 16.6% year-over-year. The percent of loans in the foreclosure process declined 0.5% in January and were down 27.6% over the last year. Black Knight reported the U.S. mortgage delinquency rate (loans 30 or more days past due, but not in foreclosure) was 4.25% in January, down from 4.42% in December. The percent of loans in the foreclosure process declined in January to 0.94%. The number of delinquent properties, but not in foreclosure, is down 413,000 properties year-over-year, and the number of properties in the foreclosure process is down 178,000 properties year-over-year. • At 8:30 AM ET, The initial weekly unemployment claims report will be released. The consensus is for 240 thousand initial claims, up from 239 thousand the previous week. • Also at 8:30 AM, Chicago Fed National Activity Index for January. This is a composite index of other data. • At 9:00 AM, FHFA House Price Index for December 2016. This was originally a GSE only repeat sales, however there is also an expanded index. Earlier: NAR: "Existing-Home Sales Jump in January"
1) As usual, housing economist Tom Lawler's forecast was closer to the NAR report than the consensus. 2) The contracts for most of the January existing home sales were entered after the recent increase in mortgage rates (rates started increasing after the election). With the recent increase in rates, I'd expect some decline in sales volume as happened following the "taper tantrum" in 2013. So far that hasn't happened. 3) Inventory is still very low and falling year-over-year (down 7.1% year-over-year in January). More inventory would probably mean smaller price increases and slightly higher sales, and less inventory means lower sales and somewhat larger price increases. Two of the key reasons inventory is low: 1) A large number of single family home and condos were converted to rental units. In 2015, housing economist Tom Lawler estimated there were 17.5 million renter occupied single family homes in the U.S., up from 10.7 million in 2000. Many of these houses were purchased by investors, and rents have increased substantially, and the investors are not selling (even though prices have increased too). Most of these rental conversions were at the lower end, and that is limiting the supply for first time buyers. 2) Baby boomers are aging in place (people tend to downsize when they are 75 or 80, in another 10 to 20 years for the boomers). Instead we are seeing a surge in home improvement spending, and this is also limiting supply. Sales NSA in January (red column) were the highest for January since 2007 (NSA). FOMC Minutes: "Might be appropriate to raise the federal funds rate again fairly soon"
In discussing the outlook for monetary policy over the period ahead, many participants expressed the view that it might be appropriate to raise the federal funds rate again fairly soon if incoming information on the labor market and inflation was in line with or stronger than their current expectations or if the risks of overshooting the Committee's maximum-employment and inflation objectives increased. A few participants noted that continuing to remove policy accommodation in a timely manner, potentially at an upcoming meeting, would allow the Committee greater flexibility in responding to subsequent changes in economic conditions. Several judged that the risk of a sizable undershooting of the longer-run normal unemployment rate was high, particularly if economic growth was faster than currently expected. If that situation developed, the Committee might need to raise the federal funds rate more quickly than most participants currently anticipated to limit the buildup of inflationary pressures. However, with inflation still short of the Committee's objective and inflation expectations remaining low, a few others continued to see downside risks to inflation or anticipated only a gradual return of inflation to the 2 percent objective as the labor market strengthened further. A couple of participants expressed concern that the Committee's communications about a gradual pace of policy firming might be misunderstood as a commitment to only one or two rate hikes per year and stressed the importance of communicating that policy will respond to the evolving economic outlook as appropriate to achieve the Committee's objectives. Participants also generally agreed that the Committee should begin discussions at upcoming meetings about the economic conditions that could warrant changes in the existing policy of reinvesting proceeds from maturing Treasury securities and principal payments from agency debt and mortgage-backed securities, as well as how those changes would be implemented and communicated. The Architecture Billings Index (ABI) dipped slightly into negative territory in January, after a very strong showing in December. As a leading economic indicator of construction activity, the ABI reflects the approximate nine to twelve month lead time between architecture billings and construction spending. The American Institute of Architects (AIA) reported the January ABI score was 49.5, down from a score of 55.6 in the previous month. This score reflects a minor decrease in design services (any score above 50 indicates an increase in billings). The new projects inquiry index was 60.0, up from a reading of 57.6 the previous month. This graph shows the Architecture Billings Index since 1996. The index was at 49.5 in January, down from 55.6 in December. Anything above 50 indicates expansion in demand for architects' services. According to the AIA, there is an "approximate nine to twelve month lag time between architecture billings and construction spending" on non-residential construction. This index was positive in 9 of the last 12 months, suggesting a further increase in CRE investment in 2017. NAR: "Existing-Home Sales Jump in January"
Existing-home sales stepped out to a fast start in 2017, surpassing a recent cyclical high and increasing in January to the fastest pace in almost a decade, according to the National Association of Realtors®. All major regions except for the Midwest saw sales gains last month. Total existing-home sales, which are completed transactions that include single-family homes, townhomes, condominiums and co-ops, expanded 3.3 percent to a seasonally adjusted annual rate of 5.69 million in January from an upwardly revised 5.51 million in December 2016. January's sales pace is 3.8 percent higher than a year ago (5.48 million) and surpasses November 2016 (5.60 million) as the strongest since February 2007 (5.79 million). Total housing inventory at the end of January rose 2.4 percent to 1.69 million existing homes available for sale, but is still 7.1 percent lower than a year ago (1.82 million) and has fallen year-over-year for 20 straight months. Unsold inventory is at a 3.6-month supply at the current sales pace (unchanged from December 2016). Sales in January (5.69 million SAAR) were 3.3% higher than last month, and were 3.8% above the January 2016 rate. According to the NAR, inventory increased to 1.69 million in January from 1.65 million in December. Headline inventory is not seasonally adjusted, and inventory usually decreases to the seasonal lows in December and January, and peaks in mid-to-late summer. The third graph shows the year-over-year (YoY) change in reported existing home inventory and months-of-supply. Since inventory is not seasonally adjusted, it really helps to look at the YoY change. Note: Months-of-supply is based on the seasonally adjusted sales and not seasonally adjusted inventory. Inventory decreased 7.1% year-over-year in January compared to January 2016. Months of supply was at 3.6 months in January. Mortgage rates were just slightly higher today, leaving them roughly in the center of a range that's persisted since mid-November. During that time the average top-tier conventional 30yr fixed rate has been briefly as high as 4.5% and as low as 4.0%. Those are the exceptions. The range has predominantly been a narrower 4.125-4.375%. The average lender is quoting 4.25% today, though there are a few offering 4.125%. • At 10:00 AM, Existing Home Sales for January from the National Association of Realtors (NAR). The consensus is for 5.55 million SAAR, up from 5.49 million in December. Housing economist Tom Lawler expects the NAR to report sales of 5.60 million SAAR in January. • During the day: The AIA's Architecture Billings Index for January (a leading indicator for commercial real estate). The Chemical Activity Barometer (CAB), a leading economic indicator created by the American Chemistry Council (ACC), posted a strong gain in February of 0.4 percent, following a similar 0.4 percent gain in January. This follows a steady 0.3 percent gain every month during the third quarter of 2016. All data is measured on a three-month moving average (3MMA). Accounting for adjustments, the CAB is now up was up 5.0 percent over this time last year, marking its strongest year-over-year performance since September 2010. In February all of the four core categories for the CAB improved, with the diffusion index strengthening to 71 percent. Production-related indicators were positive, with the housing report indicating slipping starts, but improving permits. This was coupled with an improvement in U.S. exports. Equity prices also improved at a robust pace, reflecting an improvement in consumer and business confidence. Overall the barometer continues to hint at gains in U.S. business activity through the third quarter. It was six years ago that we started discussing the turnaround for apartments. Then, in January 2011, I attended the NMHC Apartment Strategies Conference in Palm Springs, and the atmosphere was very positive. The drivers were 1) very low new supply, and 2) strong demand (favorable demographics, and people moving from owning to renting). Demographics are now somewhat less favorable, and the move "from owning to renting" is mostly over. Multi-family construction peaked in June 2015 (as I noted at the time), however more supply than demand has still been coming online. Note: The NMHC market tightness apartment survey has been indicating looser conditions for five consecutive quarters. Swelling supplies of apartment units are prompting big banks to pull back from new projects, forcing developers to scramble for capital, in a sign that the U.S. apartment industry headed for a downturn. ... fresh supply is beginning to overwhelm demand. More than 378,000 new apartments are expected to be completed in 2017, a 30-year high, according to real estate researcher Axiometrics Inc. I expect the vacancy rate to increase and for rent increases to slow. Yesterday I excerpted from a post I wrote in February 2005 (yes, 12 years ago). In that 2005 post, I included a graph of household mortgage debt as a percent of GDP. Several readers asked if I could update the graph. 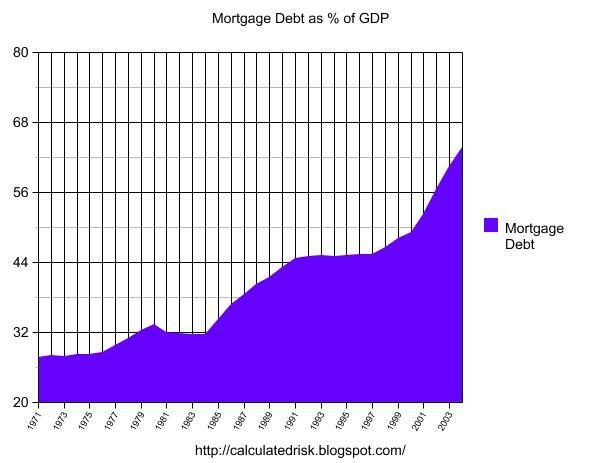 The following chart shows household mortgage debt as a % of GDP. Although mortgage debt has been increasing for years, the last four years have seen a tremendous increase in debt. Last year alone mortgage debt increased close to $800 Billion - almost 7% of GDP. The second graph shows household mortgage debt as a percent of GDP through Q4 2016. 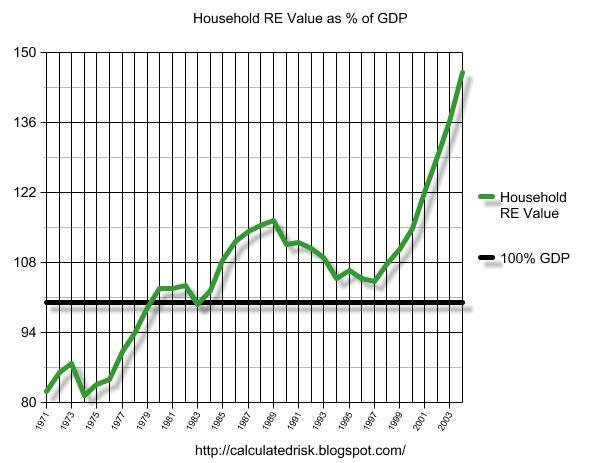 The "bubble" is pretty obvious on this graph, and the sharp increase in mortgage debt was one of the warning signs. 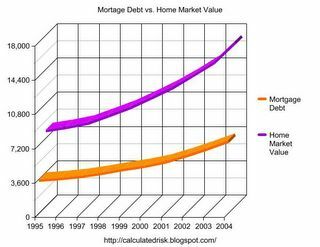 • Post from 2005: Mortgage Debt and the "Recovery"
From CNBC: Pre-Market Data and Bloomberg futures: S&P futures are up 4, and DOW futures are up 29 (fair value). Oil prices were down slightly over the last week with WTI futures at $53.69 per barrel and Brent at $56.14 per barrel. A year ago, WTI was at $29, and Brent was at $32 - so oil prices are up sharply year-over-year. Here is a graph from Gasbuddy.com for nationwide gasoline prices. Nationally prices are at $2.28 per gallon - a year ago prices were at $1.72 per gallon - so gasoline prices are up about 55 cents a gallon year-over-year. Post from 2005: Mortgage Debt and the "Recovery"
Here are some excerpts from a post I wrote in February 2005 (hard to believe this was 12 years ago). Some obervers have remarked that mortgage debt is still below 50% of household RE assets - and that is an accurate statement. 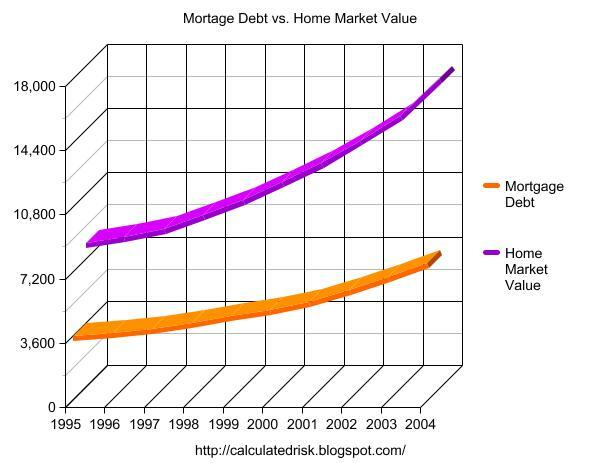 In fact, if you plot mortgage debt vs. household RE assets everything looks reasonable. 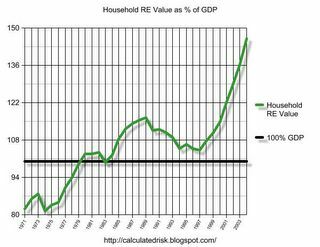 But lets plot household RE assets as a % of GDP. This final graph shows the potential problem. Household assets have really soared in the last few years. Many homeowners have refinanced their homes (or moved and taken cash out), in essence using their homes as an ATM. It wouldn't take a RE bust to impact the general economy. Just a slowdown in both volume (to impact employment) and in prices (to slow down borrowing) might push the general economy into recession. An actual bust, especially with all of the extensive sub-prime lending, might cause a serious problem. CR note: And a serious problem is what happened. Fannie and Freddie reported results last week. Here is some information on Real Estate Owned (REOs). Freddie Mac reported the number of REO declined to 11,418 at the end of Q4 2106 compared to 17,004 at the end of Q4 2015. For Freddie, this is down 85% from the 74,897 peak number of REOs in Q3 2010. For Freddie, this is the lowest since at least 2007. Fannie Mae reported the number of REO declined to 38,093 at the end of Q4 2016 compared to 57,253 at the end of Q4 2015. For Fannie, this is down 77% from the 166,787 peak number of REOs in Q3 2010. For Fannie, this is the lowest since Q4 2007. REO inventory decreased in Q4 for both Fannie and Freddie, and combined inventory is down 33% year-over-year. Don't like the data? Change it! The leading idea under consideration would exclude from U.S. exports any goods first imported into the country, such as cars, and then transferred to a third country like Canada or Mexico unchanged, these people told The Wall Street Journal. Economists say that approach would inflate trade deficit numbers because it would typically count goods as imports when they come into the country but not count the same goods when they go back out, known as re-exports. I'm all for constantly evaluating methods, and improving data collection and reporting, but this - as reported - doesn't seem to make sense. If a car is imported to the U.S., and then is unchanged and exported to a third country, it seems there would be two choices: 1) Count it is an import AND an export, or 2) don't count it as either an import or export (it is just passing through). But counting the import and not the export makes as much sense as counting the export, but not the import. Crazy. Two years ago I wrote: Demographics and GDP: 2% is the new 4%. As I noted, "One simple way to look at the change in GDP is as the change in the labor force, times the change in productivity. If the labor force is growing quickly, GDP will be higher with the same gains in productivity. And the opposite is true." Obviously demographics are important for GDP. The contribution from net immigration to total population growth has risen from 30% in the 1990s to 40-50% recently as the natural increase in population has slowed. The effect of immigration on growth of the labor force is even more pronounced as immigrants tend to be younger and therefore more likely to participate in the labor force than the native-born population. As a result, net immigration currently accounts for virtually all of the 0.5% trend increase in the labor force. Reduced immigration would result in slower labor force growth and therefore slower growth in potential GDP—the economy’s “speed limit”. In addition, academic studies suggest there could be negative knock-on effects on productivity growth. As a result, we see immigration restrictions as an important source of downside risk to our 1.75% estimate of potential growth. As Struyven notes, immigrations restrictions will lower potenetial GDP. The claimed returns to Trumpnomics are close to the highest growth rates we’ve seen under any modern administration. Real GDP grew 3.4 percent annually under Reagan; it grew 3.7 percent annually under Clinton ... But there are fundamental reasons to believe that such growth is unlikely to happen now. First, demography: Reagan took office with baby boomers — and women — still entering the work force; these days baby boomers are leaving. ... Just on demography alone, then, you’d expect growth to be around a percentage point lower than it was under Reagan. CR Note: It seems very unlikely that growth will pick up sharply, especially if there are severe immigration restrictions. The key economic report this week are January New and Existing Home sales. All US markets are closed in observance of the Presidents' Day holiday. 10:00 AM: Existing Home Sales for January from the National Association of Realtors (NAR). The consensus is for 5.55 million SAAR, up from 5.49 million in December. Housing economist Tom Lawler expects the NAR to report sales of 5.60 million SAAR in January. During the day: The AIA's Architecture Billings Index for January (a leading indicator for commercial real estate). 8:30 AM: Chicago Fed National Activity Index for January. This is a composite index of other data. 9:00 AM: FHFA House Price Index for December 2016. This was originally a GSE only repeat sales, however there is also an expanded index. 11:00 AM: the Kansas City Fed manufacturing survey for February. 10:00 AM ET: New Home Sales for January from the Census Bureau. The consensus is for a increase in sales to 573 thousand Seasonally Adjusted Annual Rate (SAAR) in January from 536 thousand in December. 10:00 AM: University of Michigan's Consumer sentiment index (final for February). The consensus is for a reading of 96.0, up from the preliminary reading 95.7. January 2017 wasn’t a great start of the year for U.S. rail traffic, but it wasn’t terrible either. Total carloads were up 2.9% (28,341) over last January, thanks mainly to a 35,798 (11.9%) increase in carloads of coal. ... Intermodal was down 1.8% on U.S. railroads in January 2017, but it was still the second-best January for intermodal on record. Coal carloads were up 11.9% (35,798 carloads) in January 2017. Coal carloads had fallen so low last year there didn’t seem to be anywhere to go but up. U.S. intermodal volume in January 2017 was down 1.8% from January 2016, as a 1.7% decline in containers joined a 3.0% decline in trailers. Still, weekly average volume of 255,267 containers and trailers in January 2017 was the second highest (behind last year) for January in history. In addition to housing starts for January, the Census Bureau also released the Q4 "Started and Completed by Purpose of Construction" report last week. We are often asked why the numbers of new single-family housing units started and completed each month are larger than the number of new homes sold. This is because all new single-family houses are measured as part of the New Residential Construction series (starts and completions), but only those that are built for sale are included in the New Residential Sales series. However it is possible to compare "Single Family Starts, Built for Sale" to New Home sales on a quarterly basis. The quarterly report released last week showed there were 138,000 single family starts, built for sale, in Q4 2016, and that was above the 126,000 new homes sold for the same quarter, so inventory increased in Q4 (Using Not Seasonally Adjusted data for both starts and sales). This graph shows the NSA quarterly intent for four start categories since 1975: single family built for sale, owner built (includes contractor built for owner), starts built for rent, and condos built for sale. Single family starts built for sale were up about 17% compared to Q4 2015. Owner built starts were unchanged year-over-year. And condos built for sale not far above the record low. The 'units built for rent' (blue) has increased significantly in recent years, but is now moving more sideways. 1) Overall sales in January were up 15.9% year-over-year. 2) Cash Sales (frequently investors) were down to 27.1% of total sales. 3) Active inventory is now down 7.7% year-over-year. This is the third consecutive month with a YoY decrease in inventory following eight months with YoY increases. This might be a change in trend - something to watch.